The Windows Live Writer has once again been updated, it’s still a Technical Preview. The new and updated version contains numerous improvements to the interface and introduces a brand new plugin model. The interface has received some updates such as a tabs for switching between views and a nice feature which allows you to edit your post using your blog theme (might have been in previous builds, but this was the first time I’ve seen it). There are now more ways to edit the images/pictures that you copy and paste or insert into WLW; such as cropping, tilting and more border styles. So no more need for using external programs to get your post look nice, except for a screen clipping app (I use OneNote). There are also new support for inserting and embedding videos from various sources. While editing you now have support for automatic linking. The Glossary has now turned into a Auto Linking feature. Other nice features are typographic characters, which for example converts (c) to a ©, word counting, “curly quotes” support and support for split posts. My favorite so far is the tidy and nicely formatted XHTML code generated by Live Writer. Now it’s easier than ever to customize your blog post using your own code. The Windows Live Writer team has also been updating the metaWeblog API, once again, so that the metaWeblog.newPost now follows the specification and uses the dateCreated field instead of a pubDate field. Windows Live Writer contains a great extensibility model, using the WLW SDK, which previously has been quite limited. With the new build you can hook into the pre- and post-publish events and you can automatically add headers and footers to your posts. The great blogging application Windows Live Writer has left the beta phase and is now released, as a part of the Windows Live Wave 2, with version 12.0.1366.1026. I have not yet found any information on what's new or what's updated, but I guess we will soon here about it! Update 2007-11-07: The Writer team has written a post about this new release "Windows Live Writer: Out of Beta". There you have it all! You can find the installer here: http://g.live.com/1rewlive/en/WLInstaller.exe (Thanks to LiveSide). Published with Windows Live Writer - non beta! A new developers community for Windows Live developers - Via Windows Live - has just been launched. The community site contains sections about Silverlight, Live ID, Live Writer, Messenger, Alerts and all the other Live products. As of now the content is quite thin, but it's up to you/us to fill it with useful information. Just register and then start using it. The site has a Wiki, a Gallery, Articles and more. And you can subscribe to the "aggregated blog of everything Windows Live". George Trifonov has written a nice tutorial on how to implement your own MetaWeblog based blog engine on his site and published the article on Codeprojectt. He also provides the full implementation in C# as a download. With the sample George enables you to use Windows Live Writer, for example, when writing blog posts. Yesterday I sat at home using my XP Media Center and decided to check out the Windows Live Gallery if ther were any new interesting Writer Plugins. I fired up Internet Explorer and browsed to the gallery via the link from one of my earlier posts to my Acronyms Plugin. I ended up in an error page that said that the request could not be handled, pleas try again in five minutes. The page was in swedish and provided a link to the Gallery start page, which also was in swedish and there were no links to the Writer Plugins. To bad for people in sweden! But, it all worked fine on my laptop a few hours ago and my first guess, which was right, was that Internet Explorer was defaulting to the Swedish language (found under Internet Options - Languages), and my laptop used English (United States). This, of course, made me to test some stuff - how do I change it to the english version without changing the browser! This seemed more problematic than I expected! I tried to search for the plugin and found nothing, even when I specified to search in Enligsh. I tried to sign in using my Windows Live account - did not matter. I tried to find some Settings on live.com that could change the market for the Gallery (this only worked on www.live.com not gallery.live.com). The help instructed me to change the IE settings. I think not having the option to change language or as it is right now, you get an error when trying to reach a page that don't exist in your language is embarrassing. I have worked with a lot of content management tools and they have at least a link to the page in the original language. Please live.com team: implement an change language/market function for the different live.com sites and a better exception handling for languages. Windows Live Writer has been upgraded and I wrote a post on the Metaweblog standard conformance of WLW in a previously. The metaWeblog.getCategories I suggested to use to get it to work with Windows Live Writer will now fail since Writer expects that a description is passed in the response. That is your response has to look like this, watch the lines 18-21 and 32-35. 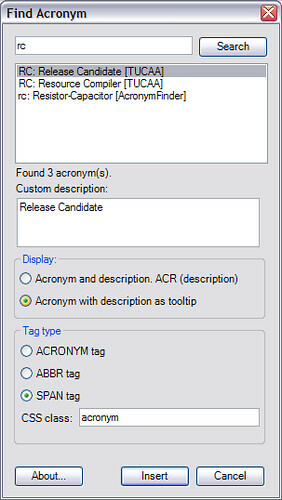 I've released a small update, version 1.2, to the Acronyms Plugin for the Windows Live Writer in which some minor bugs have been smashed and the possibility to enter your own acronyms has been fixed. Download it form the Windows Live Gallery or directly from this site. Today the Windows Live Gallery was updated with a plugin gallery for Windows Live Writer and my plugin for Windows Live Writer is updated with a new and improved interface and functionality. The Windows Live Writer team has gone through the plugin and given me good feedback, which now are implemented. If you want to download it do it here or from the Windows Live Gallery.